This morning, as I checked the weather forecast to find out what we should wear, I saw that another rainy day was forecast for today. On the other hand, it looked like we are heading towards a dry and hot weather pattern, with seven days of nothing but sunshine, coming up next week. We put on our rain pants, rain jackets and covered our packs well. We strapped on our backpacks, and headed out of town. We walked towards Iyadaniji, temple 71, which is located on top of a hill. Iyadaniji is called the Temple of the Never-Ending Valley, or the Temple Of Eight Counties, because in the old days on a clear day, you could see eight provinces of Japan from its hilltop location. It was a bit of a strain to get uphill with our heavy backpacks, but at the entrance to the temple, we were able to leave our backpacks in the covered rest area with the parking attendant. We climbed up to the temple with only our small shoulder packs. The temple is located on a rocky hill and it has some old stone carvings carved into the surrounding rocks. The description says that there are more than 1500 carvings of Amida Buddha and his disciples carved into the rock wall behind the temple. Most of the ones we saw are by now worn down by the years, the moss and the rain, and it was hard to tell that these were once stone grottos with images of the Buddha. Leading to the main hall and the Daishido was a red staircase with 108 stairs, symbolizing the 108 beads on the Buddhist prayer rosary. Jules who loves to climb stairs, RAN up those stairs, leaving me behind to climb slowly. The Nōkyōsho office and the Temple halls are located at the top, inside a charming temple building that is nestled into the rocks. We had to take off our shoes and walk up the wooden stairs into the halls. It was a quiet and serene place, and we got a chance to close our eyes and meditate for a bit, before a family arrived and started chanting and talking on their cell phones outside the door. The main altar is located inside a cave, carved into the rocks. The whole wooden temple was built around this rocky cave. Inside the cave there were lit candles and a few images made of stone. Kōbō Daishi is said to have come here to meditate as a child. The cave is called the “Shishi No Gankutsu” – The Lion’s Cave. This temple was constructed and founded by Gyōgi Bosatsu. While Kōbō Daishi was studying the Gumonjihō here, a five-beveled sword fell from the sky. The Gumonjihō that Kobo Daishi practiced here is a practice done to improve memory, to develop the ability to remember EVERYTHING that one sees and hears. This temple is attributed with more miraculous cures than any other on the pilgrimage. It is said that there are piles of crutches, artificial limbs, and medical equipment outside the Hondō, all left by the people whose handicaps were cured. Since we came from a different route, we did not see those crutches, but we did enter an inner hall full of donors’ expressions of gratitude, and prayers written on wooden sticks. From there it was an easy walk downhill towards Temples 72 and 73, as they are located near one another. But before we started walking, we sat in a cafe at the bottom of the road, and had a big toast and two iced cafes au lait. Today, we ate like two unsupervised rebellious kids. It wasn’t because this is what we WANTED to eat, it was simply because we did not pass by any other food choices and we were hot and hungry. We shared an order of “big toast,” which was served dripping with butter, with iced coffees, and for lunch we had Matcha ice cream served with cornflakes and sweet Adzuki bean paste. Not a healthy day of eating…. We walked first to temple 73 and later continued down the road to temple 72. It was built in the year 596 as the ancestral temple of the Saeki clan, into which Kōbō Daishi was born. When he returned from China, Kobo Daishi painted two mandalas signifying the worlds of the cosmic Buddha and enshrined the Dainichi Nyorai as the honzon. He also planted a pine tree that is still on the grounds. Kōbō Daishi modeled the temple after Ch’ing-Lung-Si Temple in China, and it took three years to build. From there, we walked uphill to temple 73- Shusshakaji. Shusshakaji – Temple 73 – The Temple of Buddha’s Appearance. This temple is one of the most famous on the pilgrimage. It is the scene of a very famous childhood story about Kobo Daishi. When Kōbō Daishi was seven years young he climbed to the cliffs above the temple here. He felt an inner calling to devote his life to helping all sentient beings, but he wanted a strong sign that this was his destiny. An angel appeared and saved him by catching him in her robes. 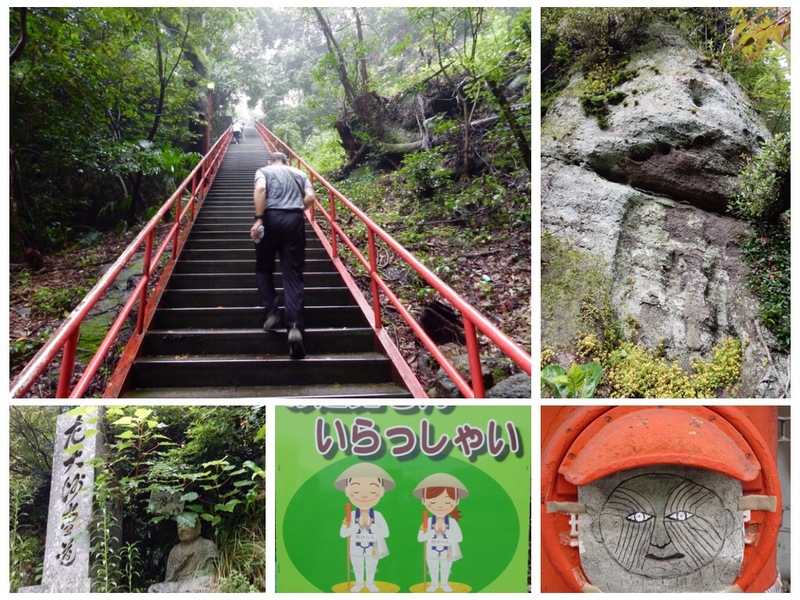 Because of this legend, this site is popularly called Shashingatake -The Jumping Cliff. The temple is popular with bus groups, and it also has a large painting showing little Kobo jumping off the cliff into the arms of an angel. As we approached the temple, we saw a temple building on a very steep cliff. Temple 73 is not located on those cliffs, but on the bottom. Luckily we did not have to climb the very steep jungle path up to the top of the cliff, but we believe that that cliff top temple’s hall is the location from which little Kobo had jumped. Later I read that this summit top temple was a place where mountain ascetics came to live and practice the Dharma. The original temple was located on that spot, but several centuries ago it was moved to today’s location at the foot of the mountain, so that it is more accessible to pilgrims. Jules adds: “This temple, Shusshakaji, was one of my favorites so far on the pilgrimage. Standing on the Temple grounds, looking up the very steep cliff at the small building marking the spot where the young Kobo jumped, really brought home to me the power and devotion of his mind to the Dharma. To not only be willing, but also to actually jump off the cliff and see whether or not a higher purpose was to be his during this lifetime…and to do this at the age of 7! Temple 74 – Kōyamaji – Temple of Armor Mountain. The temple got its name because of the mountain on which it is located on which is shaped like a helmet, or the armor of Bishamonten, the armor-clad, fierce god of warriors and a protector of the Truth. Bishamon is portrayed holding a spear in one hand and a small pagoda in the other hand. The pagoda symbolizes the divine treasure house of spiritual truths, which he both guards and gives. The temple ‘s story says that Kōbō Daishi was looking for a good site to build a temple between temples 73 and 75. One day an old sage came from the woods through a cave and said, “I am a sage who can bestow good powers, and propagate good teaching of love and light. Kōbō Daishi immediately cut out a piece of the rock and carved the image of Bishamonten and started construction. The cave from which the old sage appeared, has been rebuilt and preserved. As we walked away from this beautiful old temple nestled into the mountain with its ancient cave, we saw that a very big mining factory is located on the other side of the temple. This holy Mountain is steadily being mined to yield gravel and sand, in order to make asphalt. How can they mine such a holy mountain? The old sage no doubt still protects the temple, but the mountain behind it is slowly being carved away. Not far from the temple is the most famous of Kōbō Daishi’s civil works projects. It is a huge irrigation reservoir built by order of the Emperor. A statue of Kōbō Daishi stands on the levee. Legend states the he built the halls of Kōyamaji with the money he received for building the reservoir. From there we walked to Zentsuji, a small but growing town that was built entirely to cater to the many pilgrims that come to visit the birthplace of Kobo Daishi. By now it is a small city. Temple 75 – Zentsūji – The Temple Of The Right Path. Famous as the birthplace of Kōbō Daishi, this was the first Shingon temple in Japan. Legend states that the temple was built on sand from the eight sacred places of India, which had been given to Kōbō Daishi by his teacher Hui Kuo. It took six years to complete construction, and it was completed in 816. There is also a statue of Kobo Daishi built on rocks, with 88 images of the Buddha, each standing on sand that was brought over from each of the 88 temples around Shikoku island. It is said that those who do not have the time nor the money to do the whole pilgrimage, can just walk around this monument to get the merits of walking the pilgrimage. Jules joked that we could have saved lots of time, effort and money, by just walking around the statue…. The chief priest of this temple was traditionally appointed by the emperor. Under the main hall, we walked into a pitch black tunnel called Kaidan Meguri. Kaidan Meguri is a 100 meter long tunnel which is completely dark. It’s center marks the exact spot where Kobo Daishi was born. The walls are lined with paintings of 88 Buddhas, and in the middle of the tunnel, we could hear his words spoken from a sensor activated microphone. As we walked in the dark through the tunnel, we were instructed to have our left hand on the walls in order to follow the curve of the tunnel, and to chant: “NAMU DAISHI HENJO KONGO!” (Homage to the great Teacher brilliant shining Diamond”), constantly as we walked. When we emerged from the tunnel, we were directed to a lovely small museum with beautiful wooden sculptures dating back as early as the 4th and 5th centuries, along with beautiful scrolls. There is a beautiful park in the middle of the city which has large stone sculptures of the Buddha’s disciples who became Boddhisatvas or enlightened masters. They were similar to the ones we saw in Unpenji temple, only a bit smaller and much less of them. We stayed in the temple until closing time, because there was so much to see. As we left the large temple grounds in the center of the city, I regretted a little not staying the night in the Shukubo (temple lodging). Our hotel, the Zentsūji Grand, was not really so grand. We were given a double room, which is the biggest the hotel has, and we left to buy food at the supermarket. We chose a selection of fresh and cooked vegetables, watermelon and honeydew melon and some rice balls, a fresh roll and Katsu, along with some paper plates. We ate the simple food sitting on the beds in our room, after we took our showers. We noticed that while we are walking all day in the sun or in the steamy rain, we gravitate towards eating simple food, fruit, vegetables, nuts, rice or plain noodles. Anything more elaborate that requires you to sit and have time to digest, makes me nauseous.